What is a Smart Home? Benefits of owning a Smart Home A Day in the Life of a Smart Home Is C-Bus Automation for me? How to Get Started? Electrical Contractors very welcome at Nous House. Are you an electrical contractor engaged in or now contemplating installing Home Automation systems? Then we need you. Are you researching products or concepts for a client job? We are happy to help you with any questions you may have and to give you a login to our website with trade pricing so you can make a margin on recommending our products. We look forward to working with you in the future. In a Smart House, many automated things happen based on inputs from a wide range of sources. One of these sources is Environmental Sensors. 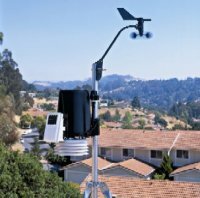 Weather Stations are a useful and highly functional group or collection of enviromental sensors. Davis Instruments have made semi-professional weather stations affordable for the residential environment and can provide many environmental 'weather' sensors to use as inputs to your home automation environment in a Smart Home. Blinds, Sun Blinds, Retractable Awnings or Louvres automation can all be commanded based on UV exposure levels, outside or inside temperatures, rainfall or wind input sensed by the weather station. Air-conditioning or Heating can also be switched on or off based on the current environmental conditions. Automatic rooftop skylight can be closed if it rains. In short, a magnitude of great information for the Smart Home can be derived from these impressive sensor bundles. Personal Weather Stations are also fun and great for people with a general interest in weather, or those who find it hard to believe the Bureau of Meteorology forecasts. Copyright © 2018 Nous House™ Pty. Ltd. All rights reserved.